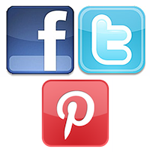 Are you connecting with us on Facebook, Twitter and Pinterest? Be sure and connect with us on Facebook, Twitter, and Pinterest for special deals and promotions! This entry was posted in Jewelry, Uncategorized and tagged facebook, pinterest, twitter. Bookmark the permalink.